The current subway in Los Angeles when it was under construction. Let’s start with this fun fact: When the Westside Subway Extension is built, it will take 25 minutes to travel from Los Angeles Union Station to the Westwood/UCLA station — 13 minutes on the existing Purple Line to Wilshire and Western and a little more than 12 minutes on the new extension. The fastest the trip can currently be done on mass transit is about 54 minutes, according to Google Transit. This fact and hundreds of others are part of the draft environmental impact statement/report (DEIS/R) for the Westside Subway Extension that is being released Friday by Metro. The voluminous report details different routes and stations contemplated for the project while also detailing the need for it and the impacts of building it. Century City would be one of the major stops along the Westside Extension. Big, long, wonky reports do not change the world. But the release of the report is a significant milestone for the Westside Extension. The DEIS/R is a necessary precursor for the project to receive federal funding and the release is a signal that Metro is hoping — after unsuccessfully trying last year — to secure federal dollars in next year’s budget. I will hazard a guess and bet that the question most readers have is this: When can I ride it? The answer: it depends. 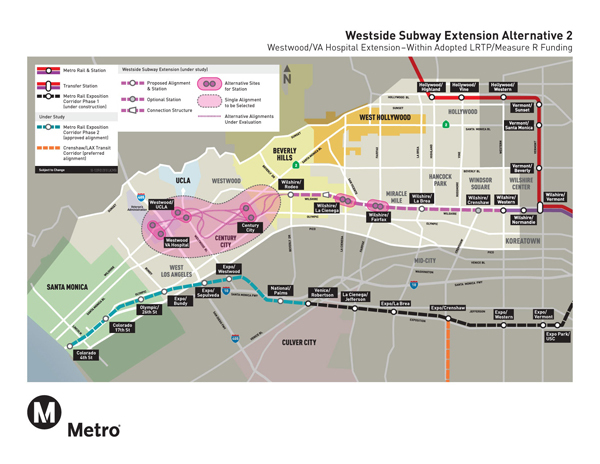 Under the long-range plan adopted by the Board of Directors of Metro last year, the subway would reach Fairfax by 2019, Century City by 2026 and Westwood by 2036 using a combination of Measure R sales tax money and federal funds. Why so long? Because the subway to Westwood is expected to cost about $4 billion and sales tax money flows into local coffers over time — not all at once. Measure R funds also have to fund a plethora of other projects promised to county voters. However, there is a plan to speed up construction of the subway. The 30/10 Initiative being pursued by Metro — and backed by many other politicians, environmental, business and labor groups — would use federal loans and other financing to try to build 12 Measure R transit projects in the next 10 years. So there’s hope. Should there be a station at Crenshaw? Where’s the best location for the station in Century City and at Westwood/UCLA? Should the subway stop near the VA Hospital in Westwood? And what about those segments of the line through West Hollywood and to downtown Santa Monica for which there is no current funding? I urge anyone remotely interested in the subway project to take the time to read the DEIS/R’s executive summary; I can’t begin to capture all the facts and information in a single blog post. Metro will also soon be holding public hearings to discuss the DEIS/R (click here for times and dates). This is also the time when the public can officially comment on the report — meaning you can praise it, criticize it or wax eloquently about what you think of the location of the tunnels between Century City and Westwood. After comments are received, the Metro staff will make a recommendation on what they believe should be further studied and built — known as the “locally preferred alternative” or LPA. Those decisions will ultimately be up to the Board of Directors of Metro, who are scheduled to vote on the LPA at their Oct. 28 meeting. Another year of environmental analysis and engineering would follow to further refine the project. •Five alternative routes were studied in the DEIS/R. The common thread in all five is a route that largely follows Wilshire Boulevard west of the subway’s current terminus at Wilshire and Western to Westwood. The alternatives involve extending the line to either Westwood/UCLA or the VA Hospital; all the way west to downtown Santa Monica; and adding a segment between Hollywood and Beverly Hills that would travel through West Hollywood. •As we’ve mentioned before, it is important to understand that the Measure R and federal funds — if secured — are only enough to build the line down Wilshire to either Westwood/UCLA or the VA Hospital. Money to build the other segments would have to be found elsewhere. •The DEIS/R shows that the segments in Santa Monica and West Hollywood would add a significant number of riders to the subway and save them commuting time. To paraphrase the DEIS/R, while those alternatives have more benefits, they achieve those benefits at a high incremental cost. •The draft study also considers two other important alternatives: doing nothing and beefing up existing bus service in the area. The study found, however, that with expected population and job growth on the Westside, buses will be traveling at eight to 11 mph in 2035 — even with the bus lane planned for Wilshire in the city of Los Angeles. Metro Rapid buses are currently traveling at an average speed of 10 to 15 mph through the area. •Trains would be running about every 3.3 minutes during rush hour on the Westside Extension and trains could hold up to 1,000 riders if fully packed. Maximum speed would be 70 mph. If you’ve ever driven 70 mph down Wilshire Boulevard, you’re either a liar or reading this while in jail. 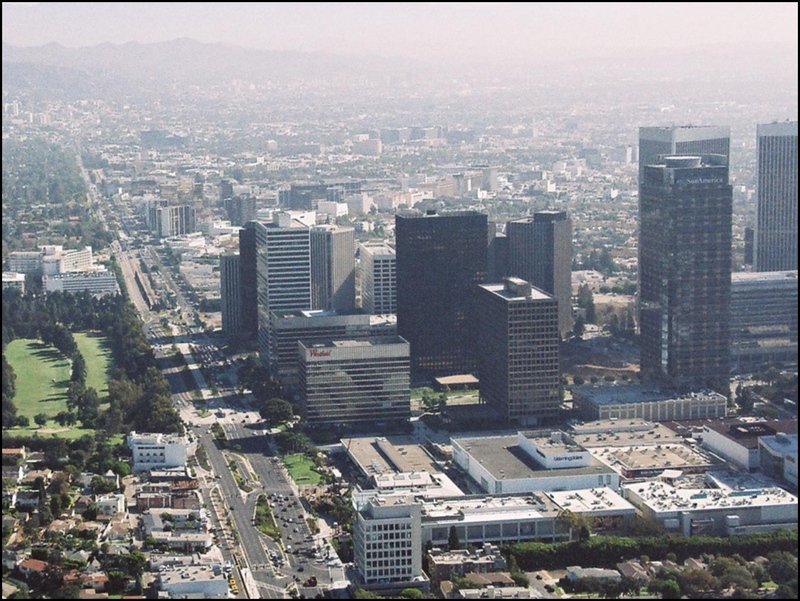 •The Westwood and Century City business districts both have more jobs than the downtowns of many mid-sized cities. Century City has 43,000 jobs per square mile and Westwood has 84,000 jobs per square mile — not counting all the students at UCLA and patients going to the campus’ medical center. Over 300,000 people from throughout the region travel into the Westside each day to go to work and many of them are driving. •This is a rather huge and obvious point, but here goes anyway: Nowhere in the report does it say that a subway will “fix” traffic on the Westside or make it disappear. The subway is expected to lure some drivers to mass transit and improve what traffic would be without the subway. The report views the subway as an alternative to sitting in traffic, kind of like building a freeway under the Westside — but one for trains, not private vehicles. •Along the route to Westwood, about 17% of the residents who live within a half-mile of the line are low-income earners. Almost half of residents who live within a half-mile of the line are minorities. 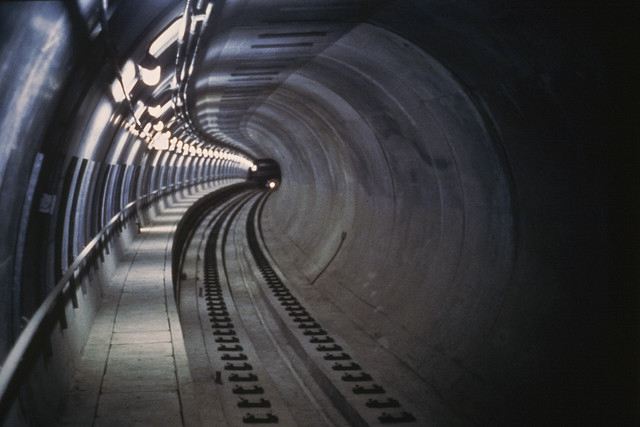 •Building the subway extension to the VA Hospital would consume 2.3 trillion BTUs of energy. But once the subway is running, an estimated 485 billion BTUs would be saved each year from mobile sources — i.e. less people driving cars. In other words, it would require a great amount of energy to build the project but over the long haul, the project would be an energy saver. 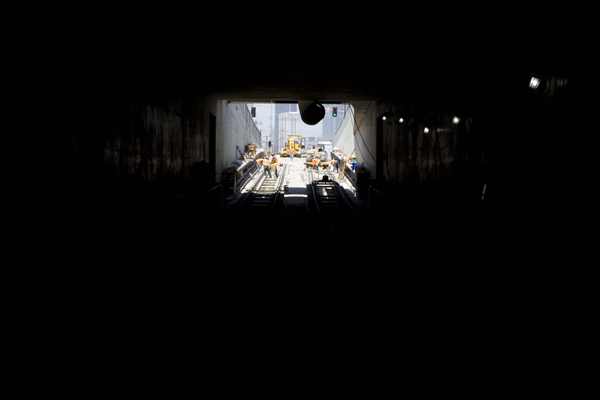 A photo of the tunnels that carry the Gold Line under Boyle Heights during construction. •The report reviews many of the more challenging aspects of construction, in particular building a subway in area with seismic challenges and where there are underground gasses. The report concludes that the subway can be built safely; the twin 1.7 mile tunnels under Boyle Heights on the Gold Line were completed on time and on budget. There is going to be lots going on with the project over the next few months. We’ll be providing coverage on The Source. You can also follow the project on its Facebook page. Should a station be built at Wilshire & Crenshaw? Where to put the Century City station? Where to put a station in Westwood? Will you ride the extension if there’s little free or cheap parking? Should there be a station at the VA Hospital?